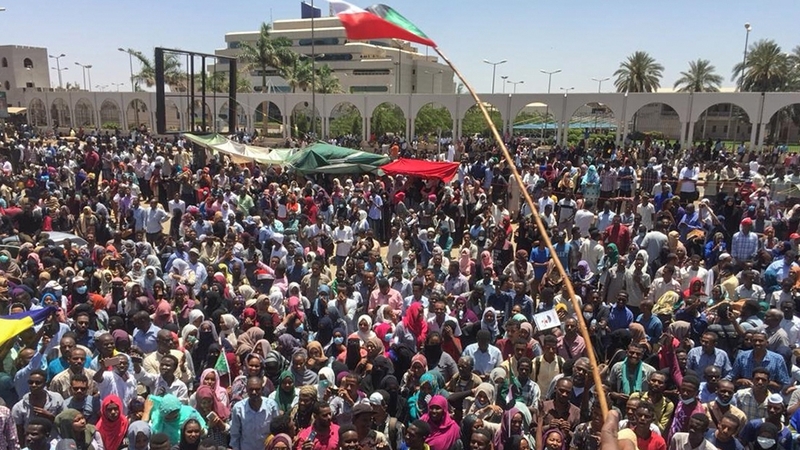 Thousands or protesters have rallied for a second successive day outside the headquarters of the Sudanese army in capital, Khartoum, urging the country's military to back their demands for President Omar al-Bashir to resign. Chanting "Sudan is rising, the army is rising, "crowds massed on Sunday outside the complex, which also houses Bashir's official residence and the defense ministry. Protest organizers chose April 6 to start the rally outside the army headquarters to mark the 1985 uprising that toppled the administration of then-President Jaafar Nimeiri. The military removed Nimeiri before handing over power to an elected government, which was overthrown by al-Bashir in a 1989 coup. Bashir, meanwhile, has refused to step down, saying that his opponents need to seek power through the ballot box and on Sunday chaired a meeting of the country's security council. "The security council confirms that the protesters are part of the Sudanese community and their vision and demands have to be heard," the Presidency said in a statement afterwards. "The council will take measures to enhance peace and security across the country." The state-run SUNA news agency on Saturday quoted police spokesman General Hashim Abdel-Rahim as saying that one person was killed "during disturbances in Omdurman". He called the protests "illegal gatherings". Human Rights Watch has said that at least 51 people have been killed during the demonstrations, however. The Sudanese leader's term ends in 2020 and he has repeatedly promised the years not to make new runs for the presidency. Without amending the country's constitution, he cannot run for a third term.